IP Finance thanks its market-friendly friend Keith Mallinson (WiseHarbor) for permission to reproduce his latest piece for cellular industry trade publication FierceWireless. Yet again, industry analysts are forecasting blow-out holiday season sales for smartphones and tablets, with extremely upbeat forecasts for 2012 overall and beyond. How could this be the very same, allegedly broken industry sector that is set to suffer innovation-stifling harm, as various prophets of doom have scare-mongered, and with what the ITU also describes as "an unwelcome trend in today's marketplace to use standards-essential patents to block markets?" Instead, according to David J. Kappos, director of the United States Patent and Trademark Office, "[t]he fact is, the explosion of innovation--and follow-on litigation--that we see across consumer electronics hardware and software is a direct reflection of how our patent system wires us for innovation." This will be most evident in our Christmas stockings this year. Patent crisis or patent nonsense? Crisis, what crisis? 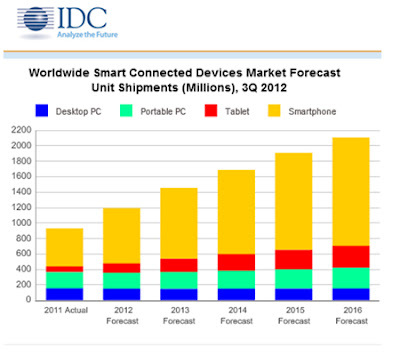 Just look at the facts, figures and industry analyst predictions. No market is more successful, and yet also based on standards-essential patents and other patented technologies, than that for these smart devices including various wireless technologies with 2G, 3G, 4G, WiFi, Bluetooth and NFC. The marketplace and competition are in rude health and going from strength-to-strength. Handset vendors benefiting from this boom include those most entrenched in patent and other intellectual property litigation, including Apple and Samsung Electronics. This is despite a $1 billion jury damages award in favour of the former and against the latter in the United States, and numerous other actions pending worldwide between these and among other parties. That award looks like a large amount but it is quite modest, in comparison to Apple's third-quarter device sales of 45.8 million at an average selling price of $744, and Samsung's 66.1 million at an ASP of $434, according to IDC. Apple derives stellar profit margins on device manufacturing by others, and Samsung profits from a vertically-integrated business model including semiconductor, display and assembly manufacturing. IDC is particularly upbeat about the market and prospects for these litigants this holiday season. The research firm thinks that Samsung and Apple will continue to lead smartphone and tablet sales this quarter as part of an estimated 362 million mobile devices shipped worldwide, worth $169.2 billion. Both figures are industry records. The predictions, which also include estimates for PCs in its broader "connected devices category," reflect the expectation many people are going to receive devices as presents this month. Tablet shipments are expected to leap 55.8 percent over this season last year. Smartphone shipments are expected to increase 39.5 percent year-over-year as well. "The consumerization trend has hit IT as an unstoppable force, as 821 million smart devices (smartphones and tablets) will be purchased worldwide in 2012 and pass the billion mark in 2013," according to Gartner, "[s]mart devices will account for 70 percent of total devices sold in 2012." Most significantly, consumers are also doing very well with vendor competition, choice and are embracing what's on offer, as above figures show. Vigorous competition and extensive choice is illustrated by Apple's rise from cellular-handset market entrant in July 2007 to value-share market leader, and with the total redefinition and invigoration of the formerly-lacklustre tablet device category with the launch of the iPad and various Android devices—largely based on smartphone hardware and software technologies—from 2010 onward. The popularity of smart devices is their powerful capabilities, convenient sizes, and with wide ranges of products and prices to suit user needs and purchaser constraints. Retina displays, multi-core application processors and GPUs, LTE, the iPad mini and larger phablet smartphones are just some examples of how performance and choice are increasing. Small and light enough to fit in one's pocket or purse, and with battery performance that sheds umbilical dependency, even with intensive consumption such as watching entire movies, these highly-portable tablet and smartphone handsets have the form factors that can be used sitting down, standing up, two-handed, one-handed and hands free. This has transformed utility by expanding where, when and how applications and services can be used. The widening range of applications and their integration with each other, and with the other devices we use--at home and away--and with the cloud, has created personal network effects that further reinforce the value of these new handset device acquisitions. You'll find no evidence of stifled innovation or market blocking in smart devices under the Christmas tree this year". Thanks, Keith - we look forward to hearing more from you in the coming year. Royalty rate guides: how helpful are they? Brands as indicators -- or as investments? When Should a Start-Up Seek Patent Protection? Fine Art: The Oddest Market of Them All?